I had my expectations set low as we headed to Upper Putah Creek. This obscure creek is located in Napa Valley and doesn't flow off any major peaks. The run starts at the crossing of Highway 29 and ends above Lake Berryessa. Flows are relatively unpredictable, as the river rises and falls dramatically with rain. Beta is quite limited, with a low flow report from California Creeks, and a terse but accurate high water description by Lars in The Bible. Daniel Basuell motivated the mission, as the run was not on my radar. Driving through pounding rain and several flooded sections of road, it was obvious that although the water level had been dropping early in the morning, that wasn't too likely at this point. We reentered cell coverage in Middletown and checked water levels one last time before putting on. 5,000 and rising, sounds like a nice perfect level. At the bridge it's apparent the river is high, and very brown. Almost impossible to tell how high it is really, clarity is only 2-3". Daniel and I push off into the current and enjoy the swift flowing water, we are averaging at least 5mph through the flat section. The infamous brush is no problem. Even though some willow stands are still above the brown deluge, it's easy to switch from channel to channel through gaps in the branches. Sticks and flotsam are constant, the most debris either of us have seen on a river. The occasional full sized tree is in the mix too...hmm. Soon enough we fly by the Basalt cliff that marks the beginning of the first gorge. A big water splashy class III behind us and we catch a rare eddy on river right and catch our breath. Not having read any guides for the run I go for main channel on the left. Boy I'm glad I just returned from a month long big water experience in India, because reading big water on the fly is a whole new game. Once ferrying across the river it's apparent that we're committed to the rapid, which appears to be a big wave train ending with...a massive wave above what appears to potentially be an even larger hole. The lead in waves are peaking at six feet, but from the crest I still can't see if it's a hole or wave below. The only thing to do is assume the worst and start driving right, punching a curler that feeds into the feature. Pulling through the curler I look left and see the feature, a fifteen to twenty foot crashing wave is friendly, and much more akin to a big water feature in India than California. Jetting downstream I check and see Daniel is still in good shape behind me, and we push to a small eddy on the right to catch our breath and get a quick shot of the rapid. Looking back upstream at "Numero Uno"
From our rest point visibility is limited due to brush, but the gradient doesn't look too extreme around the corner, so we peel out and are right into "Numero Dos". We're driving right again because the "huge rock lurking in the middle of the channel" is once again either a large wave or hole...too risky to tell from above, but I glance over as we speed past on the right and it's another epic breaking wave. The third and last rapid of the gorge is just a big fun wave train. In reality all the rapids blend together, and none are harder than IV but a swimmer would be forced to swim them all, stepping up the hazard rating. 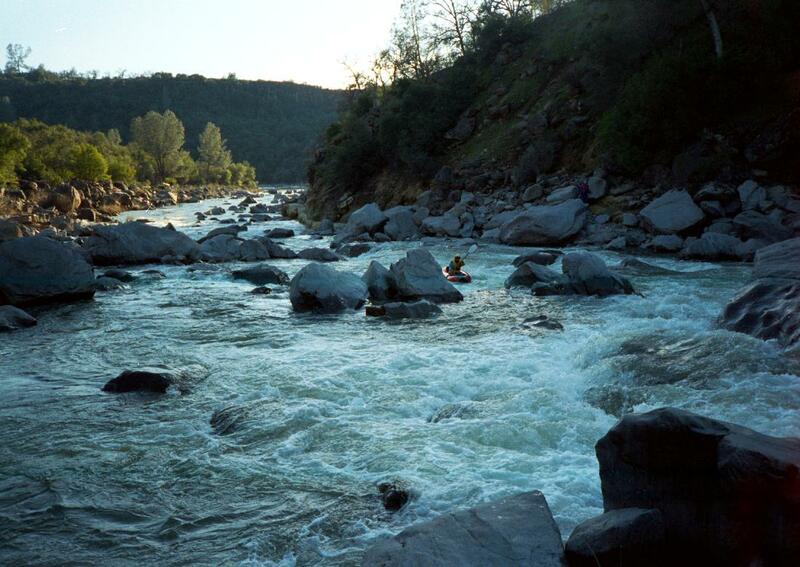 Walls open up and gradient cools off, we float through swift open sections with no remarkable rapids. Soda Creek tumbles in from the left, marking the start of the flattest section. Tumbles in might be an understatement as the creek adds in one to two thousand more cubic feet of water each second. Now that we're on what seems to be 8,000-10,000cfs the flats go by faster, and we run a big class III rapid, wondering if it was part of the final gorge we are anticipating. Just a minute later and we are at the brink of another drop, the first that looks very dubious from above. Opting to play it safe, we get out to scout on the right and surprised to see what looked like a ledge is just a nice ramp, one more fun class III rapid. Having just two of us and no pictures of people on the river yet, I coerce Daniel into going first. Same rapid, just zoomed out. Gigantic eddy lines and boils abound! Floating downstream the hills open up to a valley filled with a vineyard. Knowing civilization and take outs go hand in hand, we surmise that must have been the last gorge, a bit of a let down. Crusing on, we know we aren't done as the rock walls rise from the sides and the river turns into a big wave train...looks good to go so we drop in. The wave train is splashy and fun, it leads into another large wave train, big enough we move to the right in case there are hidden holes. The bottom of the rapid feeds into slack water that isn't as slack as expected. Downstream all I can see is a giant rapid that wraps around the corner, but looks relatively good. Moving into the rapid it's apparent there are large holes down the center, and a cliff defines the right side. We move right, avoiding the holes, but quickly have to run a fine line between a big pourover on the wall and a thirty foot wide hole in the middle. Whew, it's all big water fun as the rapid turns into a long, wide wave train. The river bends to the left and we find one rock in the middle to eddy out behind, agreeing that the rapid verged on class V at these flows. At high flows we had no chance of finishing in the left channel, so we worked down the right and then ferried across to avoid all the bushes at the bottom, and were quickly headed into the next rapid. Numero Quatro and Numero Cinco down in one fell swoop, now for Seis. Once again we were driving right, but not too right, as the right wall had several depressed pockets and center was full of big holes. We threaded the needle between the features and emerged into a big wave train. Berryessa was low enough that there was no slack water, and there certainly was no chance of paddling up Butts Creek as recommended, so we bushwhacked downstream, trying to avoid all the houses on the hill. We must have put on right at the peak flow of 7,500. The gauge is just downstream of the bridge, and the tributaries were dumping in water, for what must have culminated to 10,000cfs by take out. Three hours from put-in to take-out with no flatwater paddling and one scout, not bad. If you can catch it on a flow window like this, Upper Putah Creek is really a hidden gem of big water in California, honestly the best I have paddled here yet, even if it only has six rapids in sixteen miles.